The electrical kindling model requires that animals are first surgically implanted with chronic indwelling electrodes. Though exact surgical procedures vary from laboratory to laboratory, there are several aspects of this procedure common to most. In describing the steps involved in preparing an animal for the kindling procedure, the relatively simple and inexpensive system of Molino and McIntyre14 will be described (see Figure 3.1). Table 3.1 provides a comprehensive list of the necessary supplies and equipment. Proper placement of the stimulating/recording electrode into a particular brain region is accomplished via standard stereotaxic techniques. 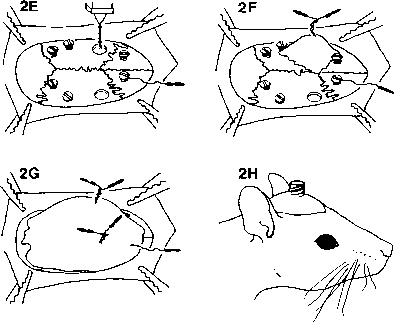 As a number of detailed reference books on stereotaxic surgery in the rat exist,15-18 this chapter will discuss only briefly some critical aspects of stereotaxic technique. Introduced nearly 90 years ago by Horsley and Clark,19 the premise of stereotaxic surgery is that there is a constant and fixed relationship between the brain and two standard fixation points; the bony external auditory meatuses and the palate. With the head of the animal firmly fixed in position, the location of a particular brain structure can be determined by consulting one of many stereotaxic atlases.11-13 The atlas used most commonly is that of Paxinos and Watson.11 Atlases can differ from each other in two major ways: (1) whether bregma or the interaural line is used as the reference point from which to determine the stereotaxic coordinates, and (2) whether the skull surface is positioned flat or at an angle relative to the horizontal plane. 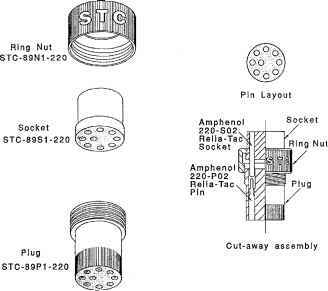 Schematic of the components comprising the McIntyre headcap apparatus. The plug is attached to the animal, whereas the socket is attached to the set of leads attached to the polygraph. Ordering information is located on the bottom right. 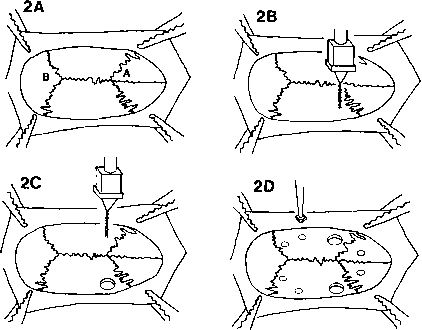 Series of schematic drawings illustrating steps involved in the implantation of stimulating/recording electrodes. A detailed description of each of the drawings is described in the text: 2A, steps 7 and 8; 2B, step 13; 2C, steps 13 and 14; 2D, step 15; 2E, steps 16 and 17; 2F, step 18; 2G, step 19; 2H, step 20. A and B in 2A represent bregma and lambda, respectively. also reported greater accuracy with bregma when the anatomical structure of interest is located anterior to this reference point. Although Paxinos and Watson11 confirmed this finding, they also noted that the interaural reference point may be better suited for localizing more posterior structures. A critical parameter to be aware of when using a particular stereotaxic atlas is the rostral fixation point on which the atlas is based. In some atlases the toothbar is fixed 5 mm above the interaural line,12 whereas in others the toothbar is set so that bregma and lambda are on the same horizontal plane.11,13 It has been reported that adjusting the position of the toothbar such that the skull is horizontal minimizes errors when rats of different sizes are used.20 Regardless of the level at which the skull is positioned, it is imperative that it corresponds to the stereotaxic atlas being used. The implantation of two electrodes can take between 45 and 90 min. A sufficient level of anesthesia must be maintained throughout this time. Sodium pentobarbital is a frequently used anesthetic and is administered directly into the peritoneal cavity (i.p.). The effective dose can vary depending on the strain of rat one is using. An adequate dose for Long Evans Hooded rats (between 250 and 500 g) is between 50 and 60 mg/kg. Alternatively one can use inhalant anesthetics such as halothane, which allows for better control of the depth of anesthesia. If using this latter method, it is important that an adequate ventilation or scavenger system be available as repeated exposure to low levels of halothane has been reported to have toxic effects. For assistance with doses and routes of anesthetic administration, consultation with animal care personnel is recommended. free rats, it has been the experience of several researchers (D. C. McIntyre, personal communication) that this is no longer the case. Aseptic surgery procedures will reduce greatly the chance of introducing pathogens during surgery. Pathogens, such as Staphylococcus epidermitis, are known to be associated with disintegration of the skull surface and increased loss of headcaps. Given the prolonged duration of many kindling experiments, it is critical that the integrity of the skull be maintained for an extended period. Use of gloves and mask, as well as application of a penicillin G solution (personal observation) onto the cranial surface prior to the drilling of electrode holes are important to reduce or prevent the likelihood of postsurgical infections. The steps involved in the implantation of stimulating/recording electrode(s) are listed below. Cooley and Vanderwolf,17 as well as Skinner,16 have also provided a detailed step-by-step approach to stereotaxic surgery with excellent pictoral and photographic accompaniments. Those attempting stereotaxic surgery for the first time should remember that proper placement of the head into the stereotaxic apparatus is critical for proper placement of electrodes. This is sometimes difficult at first. If possible seek the guidance of experienced personnel during initial attempts. The procedure described in this chapter involves the implantation of two electrodes since many kindling experiments are designed using two or more electrode sites. However, one electrode is sufficient to kindle an animal. 1. Prior to surgery sterilize instruments, gauze pads, and cotton swabs. Maintain in sterile condition until use. The glass bead sterilizer device listed in Table 3.1 is a convenient means of sterilizing surgical instruments and meets National Institutes of Health (NIH) guidelines. During surgery, place intruments on sterile draping. If reuse is required during surgery and a glass bead sterilizer is unavailable, immerse in liquid disinfectant between procedures. 2. Prepare bipolar stimulating/recording depth electrodes and the screw/electrode that will serve as ground prior to surgery. Depth electrodes consist of a single strand of stainless steel wire with a Teflon®* coating. Typically the diameter of the wire is between 100 and 200 pm. Between 0.25 and 0.5 mm of insulation is scraped from both ends of the wire and subsequently soldered to Amphenol (220-P02) pins. The wire strand is then twisted to create the bipolar form, and cut to the desired length. Ground reference electrodes are easily constructed from insulated wire that is greater in diameter than the wire used for bipolar depth electrode construction. Again the insulation is removed from both ends (again between 0.25 and 0.5 mm of uninsulated wire should be exposed at both tips). One end is soldered to a jeweler's screw and the other end is soldered to Amphenol pins identical to those used for depth electrode construction. The viability of all electrodes can be determined using a voltmeter. Each rat will require a single depth electrode for each site one wishes to stimulate/record, one ground, and five jeweler's screws. A maximum of four bipolar electrodes can be implanted using the McIntyre connector unit. * Registered trademark of E. I. Du Pont de Nemours and Company, Inc., Wilmington, Delaware. 3. Prior to surgery place cut depth electrodes, ground electrode, screws, and drill bits in a liquid disinfectant for 15 min. Remove and place on sterilized gauze. Ensure that disinfectant has been thoroughly absorbed by the gauze prior to use. Alternatively these items may be sterilized with ethylene oxide. 4. Anesthetize rat. Once the level of anesthesia is sufficient, such that the rat no longer responds to a firm tail pinch, proceed to shave the scalp with electric clippers. The shaved region should include the area extending from between the eyes to just behind the ears. 5. Position the rat in the stereotaxic apparatus. Correct positioning of the rat is crucial to accurate electrode placement. One way to determine whether the rat is placed correctly in the stereotaxic unit is to grasp the snout and assess the movement of the head from side to side. As noted by Cooley and Vanderwolf,17 movement of the snout by more than 4 mm laterally, in either direction, indicates improper placement. First time users should confirm with more experienced users as to whether the rat is properly positioned before proceeding. To maintain a more sterile environment and to aid in maintaining body temperature, place a sterile cloth over the body of the rat. 6. Administer a few drops of sterile eye drops into each eye. Cleanse and disinfect the incision area using a combination of three different solutions (hibitaine, 70% alcohol, and bridine). The incision area is first swabbed with hibitaine, followed by 70% alcohol, and then a final swab with a small amount of bridine. 7. Make a midline incision in the scalp using firm pressure to ensure a clean cut in a single stroke. The incision should extend from the area between the eyes to the area between the ears. Do not extend your incision beyond the transverse bony ridge behind the ears. 8. So that it is possible to locate the standard reference points on the skull (see Figure 3.2A), the subcutaneous layer of tissue covering the skull (periosteum) first must be removed. This can be achieved in one of two ways. In the first, the periosteum is simply scraped back on both sides using a bone curette. The second approach involves careful removal of the periosteum by making an incision in the periosteum at the anterior point of your cut. Using your scalpel, proceed to cut the periosteum along the edges of the skull being very careful not to cut into muscle. Forceps and scissors can then be used to pull back the periosteum and cut it free from the skull. This latter method prevents temporary swelling of the periosteum which can sometimes prevent proper adherence of the dental acrylic along the entire skull surface. 9. Using hemostats, or towel clamps, expose the skull surface (see Figure 3.2A). If possible, gently pinch an edge of the remaining periosteum with the hemostats rather than the scalp. 10. Using sterile cotton swabs, wipe the skull surface several times to remove blood and other debris. Apply a few drops of a solution of penicillin G (approximately 300 to 400 IU/pl) onto the skull surface and allow to sit for 1 to 2 min. Then use a cotton swab to absorb the solution. Rinse surface of skull several times with sterile saline. 11. The next series of steps will describe how to determine the exact location at which to place the electrode, using bregma as the reference point. If using an atlas based on a flat skull position, ensure that lambda and bregma are on the same horizontal plane. This is facilitated by setting your electrode into the electrode holder of your stereotaxic apparatus. It is critical that the electrode is positioned so that the tip of the electrode is straight and perpendicular to the skull surface. One can now determine visually whether the two points are horizontal by positioning the electrode over bregma, lowering it until it just touches the skull, and taking a depth reading off the scale. Perform a similar step, this time positioning the electrode over lambda. If the skull is horizontal, the depth readings from lambda and bregma should be identical. 12. To obtain the coordinates for the location of your electrode(s), first determine the stereotaxic coordinates of bregma. Obtain both an anterior-posterior reference, as well as a lateral reference point, by placing the tip of your electrode directly over bregma and slowly lowering until the tip is touching the skull. Determination of coordinates is achieved by reading the vernier scales on the stereotaxic apparatus. Use these coordinates to calculate the position at which the electrode hole(s) should be drilled. Simply stated, you need to determine the distance that the electrode tip must be moved anterior (or posterior) and lateral from bregma so that it will be above the brain structure you are interested in. This distance is easily determined by referring to a stereotaxic atlas. So time is not wasted during surgery these latter coordinates should be determined prior to anesthetizing the rat. 13. Move the electrode holder so that the tip of the electrode is directly over the area of interest. This is accomplished by adjusting the anterior-posterior scale and the lateral scale to the coordinates calculated in step 12. At your new location, lower the electrode tip so that it is just touching the skull surface (see Figure 3.2B). Mark this spot with a fine-tip marker. Double check that the mark is in the correct spot. The next step is to drill through the skull at this location using the larger drill bit (o.d. 1.0 mm). Drill into the skull gradually, checking frequently whether you have successfully passed through the skull. Extreme care should be taken not to drill into the brain. If sufficient care is taken while drilling, the dura will remain intact. Use a sterile hypodermic needle to cut the dura. This latter procedure should be performed gently so as not to pierce the brain. 14. If implanting two or more electrodes, repeat step 13 until all electrode holes have been drilled. Continue to use the same electrode tip to determine the location of new electrode holes. The accompanying figures (Figure 3.2B and C) illustrate the implantation of two electrodes into the amygdala. 3.1. Drill six holes placed at locations that will give you a broad base for your skull cap. Allow space between the jeweler's screw and the skin for dental acrylic to adhere. Figure 3.2D illustrates positioning for jeweler's screw and ground pin holes. It is important not to drill closer than 0.5 mm to the midline suture, as the sagittal sinus is located just below this line. 16. Rinse the skull several times with sterile saline to remove bone chips and blood. Carefully insert jeweler's screws and ground into the appropriate holes. It is critical that screws and ground are inserted into the skull no more than about 1 mm in depth to avoid depressing the surface of the brain. 17. With screws and ground in place, one can now implant the electrode(s). Reposition the stereotaxic electrode holder such that the tip of your electrode is over the first hole (Figure 3.2E). Insertion of the electrode can occur by using either the surface of the brain as the reference point from which to begin lowering your electrode or by using the surface of the skull. Only the latter method will be described, as it is difficult to visualize the surface of the brain. In determining the position of the skull surface, the fluid that has accumulated in the electrode hole is used as a reference point. After ensuring that the fluid in the hole is level with the skull, slowly lower the electrode tip until it just breaks the surface tension. Determine the depth coordinate at this point and calculate, based on the predetermined coordinates obtained from your atlas, the depth to which the electrode must be lowered to be correctly positioned in the appropriate brain structure. 18. Once the electrode is lowered, acrylic cement is then used to fix the electrode in place. Mix a small amount of powder with the liquid solvent (methylmethacrylate) until it reaches a consistency of a thick syrup. Apply the cement to the area around your inserted electrode. If inserting more than one electrode ensure that the cement is applied in a manner such that it does not run into other electrode holes. Allow this layer of cement to dry (approximately 5 to 10 min) before proceeding. Once the electrode is securely in place, remove the electrode from the holder (see Figure 3.2F). Repeat this step if implanting more than one electrode. 19. Once all electrodes are securely fixed with dental acrylic, fill in the remaining surface of the exposed skull with dental acrylic so that it is level with the surface of the scalp. Remove hemostats once the dental acrylic begins to harden. Allow this layer of acrylic to dry completely (see Figure 3.2G). 20. Carefully insert and snap the electrodes into the Mclntyre connector using the needle nose hemostats. Make sure a protective ring (see ring nut, Figure 3.1) has been placed on the connector prior to inserting electrodes. If rats are to be housed in bedding chips, protective rings can be ordered that will prevent debris from becoming lodged within the electrode holes. It is important to record which electrodes are inserted into which of the nine holes in the connector. It is best to establish a routine within a laboratory so that a standard configuration is employed by all users of the kindling apparatus; i.e. the ground pin should always be inserted into the same spot, and the two pins that comprise a single bipolar electrode should always be inserted into two holes known to represent a single electrode. This configuration can then be matched to the leads attached to the polygraph, allowing for easy recording and/or stimulating from a particular site. 21. Once the pins are inserted into the connector cap, carefully arrange and bend the wires of each electrode so that they are not touching other electrodes or ground wires. Set the cap so that it is positioned straight and as close as possible to the layer of dental acrylic. Begin applying dental acrylic until all the wires are covered and a smooth headcap is created (see Figure 3.2H). 22. Place the rat under a warming lamp until the rat becomes mobile. Analgesics such as children's Tylenol®* should be administered at this point (suppository form: approximately 7 mg/kg). 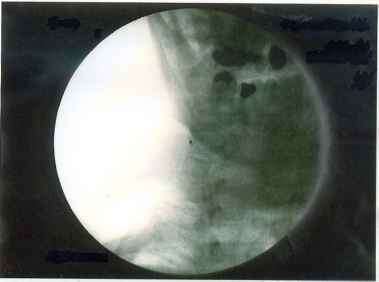 To minimize the incidence of subsequent infection, a subcutaneous dose of penicillin G procaine (22,000 units/kg; i.m.) should be administered before the rat regains consciousness. Rats should be allowed 10 to 14 d postoperative recovery prior to the initiation of kindling. During this time, rats should be singly housed to prevent them from grooming and damaging headcap assemblies of cage mates. It is also best if they are kept in a deep cage with a shallow cover to minimize damage to the headcap. * Registered trademark of McNeil Pharmaceuticals, Fort Washington, PA.
will minimize the stress on the rat once the kindling phase is initiated, allowing the researcher to more easily connect, and disconnect, rats during the kindling trials.